I’ll be at the top in about 10 minutes, I think to myself as I size up the sand dune in front of me. 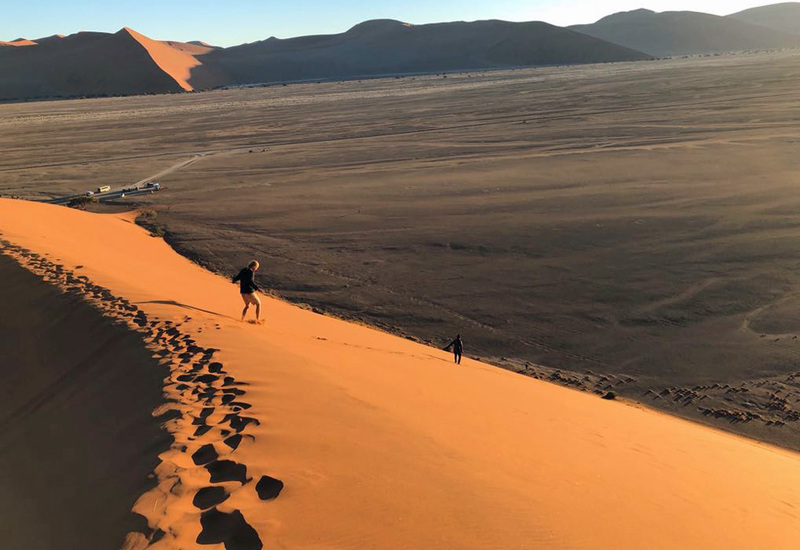 Namibia’s Dune 45 doesn’t look so big from the ground, so it should be no problem to reach the peak before sunrise, which is rapidly approaching on this frigid winter morning. Ten minutes later, my feet start to go numb from walking on sand that’s so cold it feels like snow. I’m not even halfway up the dune, and I realize this is going to be a much more challenging undertaking than I’d originally believed. Dozens of other shivering tourists are making the climb with me. Most don’t look particularly enthused about the trek, but everyone presses on. 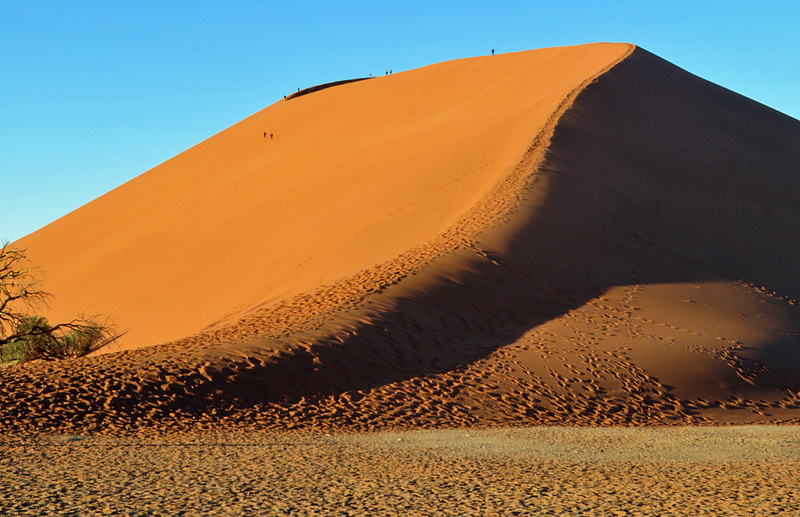 Eventually, I make it to the top ridge of the dune, although that’s not even the true peak, because off in the distance there’s another higher part of the dune that goes higher. I sit back and watch the sun rise, enjoying its warm rays that counteract the roughly 40° F (4° C) temperatures in the air. 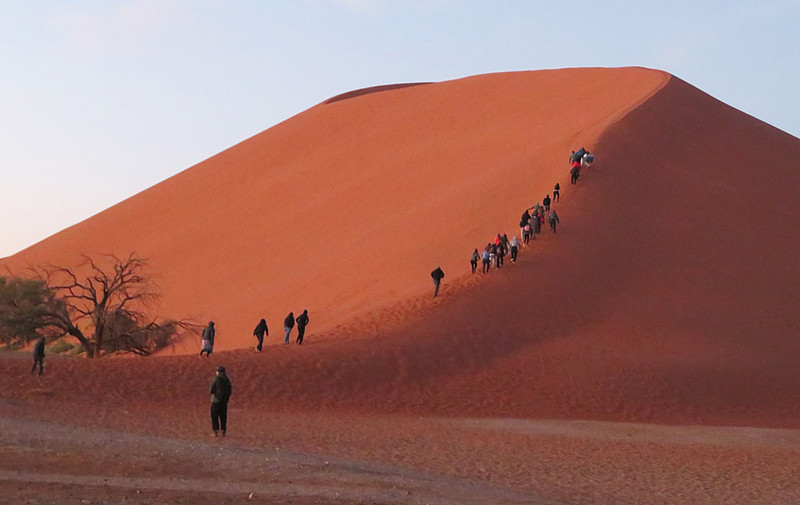 Before long, everyone’s taking their dune selfies and sitting back to admire the view from one of Namibia’s most scenic and popular locations. The Dune 45 climb was well worth it. 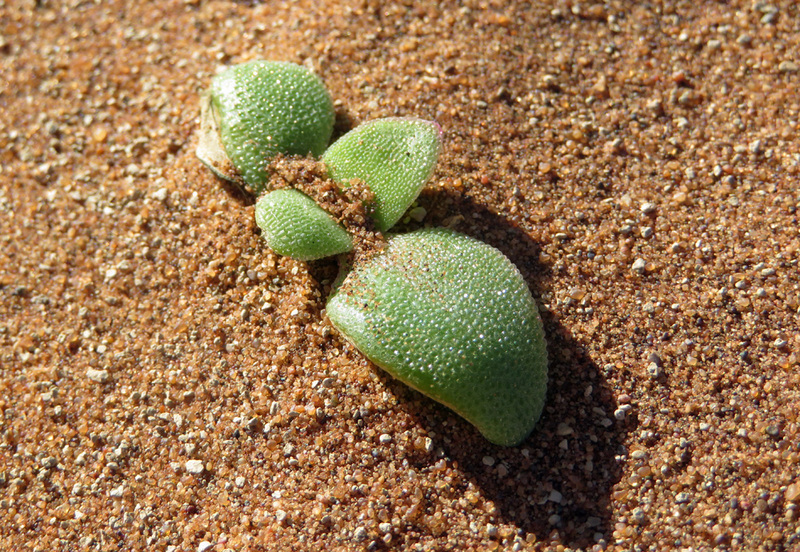 Located not far inland from the Atlantic Ocean, the Namib Desert is considered the world’s oldest desert. The orange-hued sand here is roughly 5 million years old. 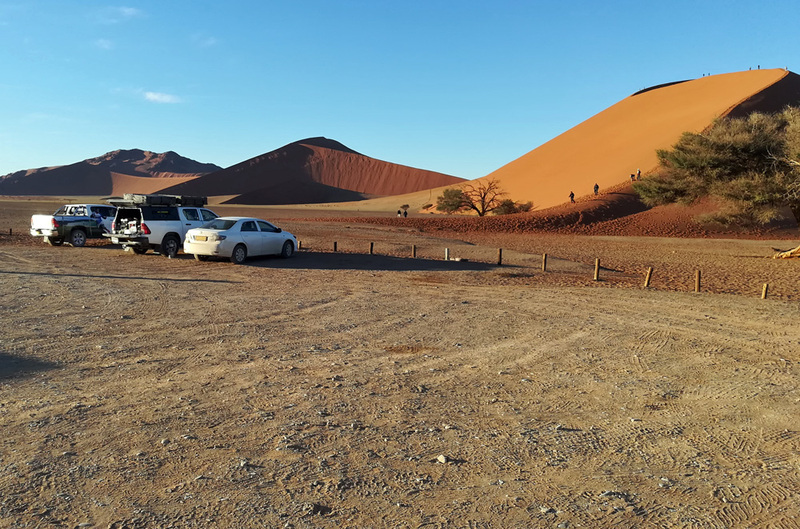 Dune 45 gets its name from the fact that it’s located 45km north of Sesriem, the entrance point for Namib-Naukluft National Park. Some dunes in the world only receive wind on one side, but Dune 45 is hit by winds from multiple directions. That makes it a “star dune.” The swirling winds create various legs or appendages extending out from the dune, giving an appearance similar to a star. This is the area you may have seen on nature documentaries. It gets very little rain annually, but some plants and animals are able to survive because of the morning fog that rolls in from the ocean. I spotted several little shrubs, and you can even see this one glistening from the dew it has collected. Because of its imposing stature and convenient location, Dune 45 is sometimes referred to as “the most photographed dune in the world.” It stands roughly 170 m (560 feet) tall. 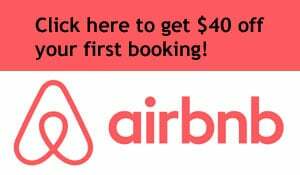 If you make it to this part of the world, you’ll either be renting a vehicle, or participating in a group tour. 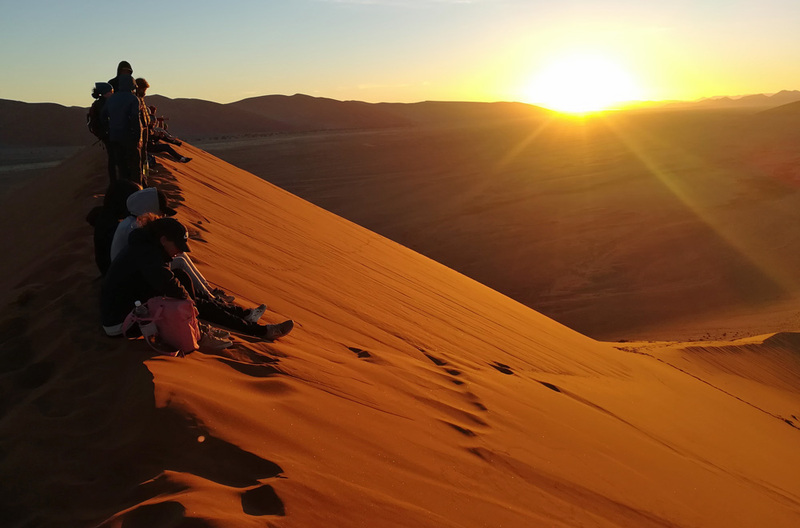 If you’re on a tour, they’ll be sure to get you here before sunrise, since watching the sun come up while sitting atop the dune has become the cliché (but very worthwhile) tourist activity. If you’re driving yourself, be sure to leave in plenty of time to get here. Sunrise is a busy time, with lots of visitors, but the tourists continue to show up all day long, so don’t let their presence dictate your arrival time. There’s a good-sized parking lot just at the foot of the dune. Bring some water on your walk to the top – especially if it’s summer when you visit. 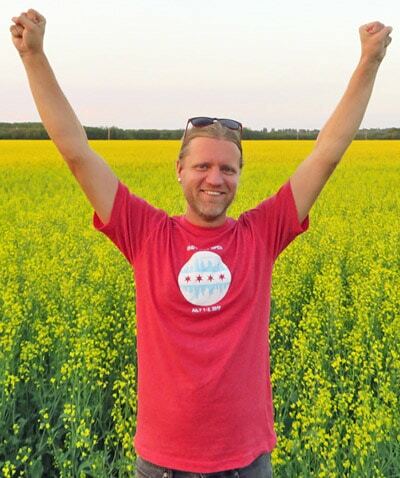 In the warmer months, temperatures can get really hot, really quick, so you’ll want to stay hydrated. Be sure to dress appropriately for the season. Winter here is June through September, and summer is December through March. Obviously, a camera is a must. The further you walk along the top of the dune, the fewer other people you’ll run into. 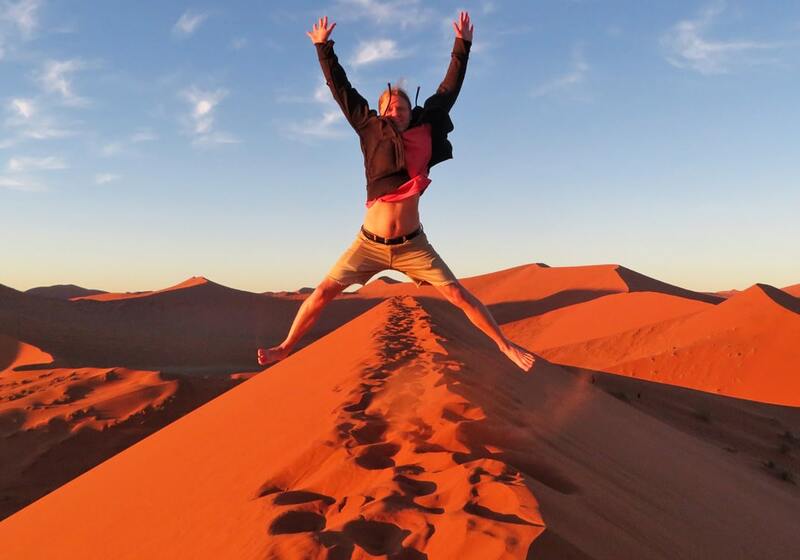 So it will be possible to get your solo “walking along the dune” photo. And finally, once you’re ready to go back down, run down the side of the dune! This is a sure way to feel like a kid again. 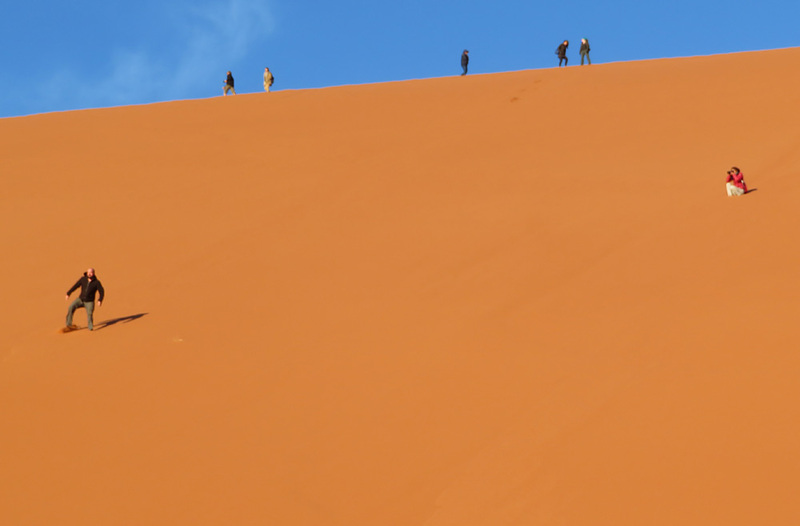 It may look intimidating, but it’s pretty easy to scamper down the steep side of the dune. 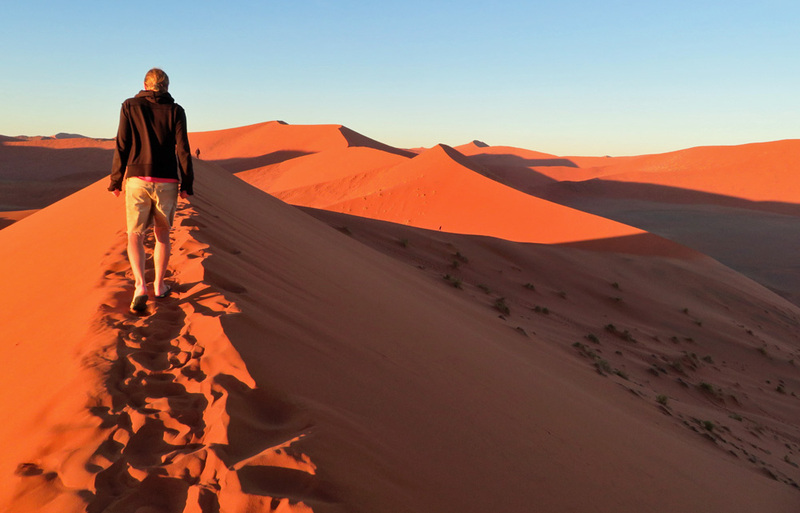 Running down the dune at an angle is strongly advised over going down in a straight line. The latter method is steeper and makes it more likely you’ll fall on your face. One of my friends bounced from side to side, using a slalom ski technique down the hill. I chose to take big hop-steps. You’ll come up with the technique that works best for you! 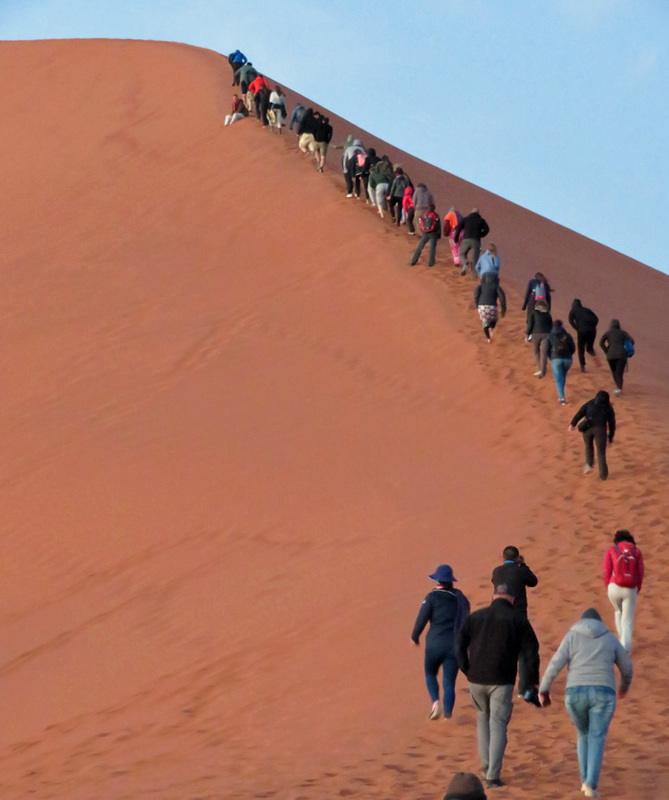 Would you hike up this huge sand dune?